My brother gave me nice collection of His Majesty Sultan Qaboos's photos. I loved the whole photos, but I chose this specific one because I love Queen Elizabeth and I think they are both look elegant here, like prince and princess. Well, it's not possible to look at them as a couple because it is … impossible!!!. But they are really...really charming!!! 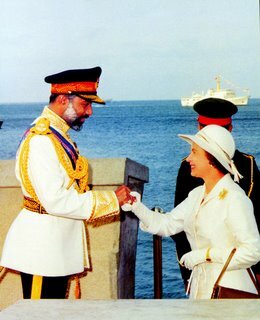 Anyway, I love Sultan Qaboos and I love to collect all his photos, also I collect queen Elizabeth's photos. He is a blessing to Oman! Finally one of you commented on this post. They are really wonderful, both of them. I don't know in which year was this pic taken or when Her Majesty came to OMAN. But I know they are sweet and I love them sooooooooooooooo much. to properly looking for payed off parttime task.